SEBO leads the industry through innovation and delivering convenience to the user. The D4 canister vacuum provides simple operation and durable longevity while cleaning not only the floors, but the air in the home as well. With the customer always in mind, the German engineered and manufactured SEBO D4 rejuvenates homes like no other vacuum. The D4 Premium comes standard with the ET-1 power nozzle while the D4 comes with the option between the ET-1 and the ET-2; both the ET-1 and ET-2 power nozzles feature manual height adjustment allowing the user to raise or lower the brushroll to the correct height to contour to the level and pile of the carpet. The 3.5 inch low-profile easily cleans under furniture and beds where unseen dust builds up. In the event a sock or some bit of clothing gets vacuumed, the ET-1 and ET-2 will shut off immediately thanks to the anti-brushroll jam feature. Additionally, if the brush does not spin at the optimum RPM, an indicator light comes on and the power nozzle shuts itself down. If anything becomes clogged, a one-push button ejects the brush for cleaning or replacement. 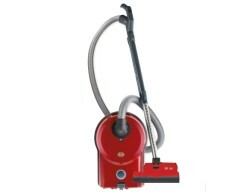 While vacuuming, the user can monitor airflow power with the LED indicator on the canister. If the airflow becomes choked or does not meet the requirement, the user simply pushes the increase or decrease button found on the hose handle or changes the height on the power nozzle to rectify the loss of suction. Throughout cleaning, the canister easily glides across the floors and rotates to convenient locations upon four rubber castors as the 40 ft. power cord provides 52 ft. of radial cleaning capabilities. A common con and fault of canisters is that they bump into furniture, taking chunks of chairs out. SEBO crafted the D4 with an airbelt bumper to preserve your furniture throughout years of cleaning work. The SEBO D4 not only cleans your carpet and hardwood over time, but the air around you as well thanks to the hospital-grade filtration system operating through the machine. The filters remove 99.97% of all pollutants and allergens down to .03 microns (to put things in perspective, the average human hair measures at a diameter of 100 microns). For pet owners dealing with dirty dander or allergy sufferers who need the cleanest air to save their nasal passages, the SEBO D4 delivers time and again. A five (5) year warranty covers all non-wear parts of the SEBO D4 canister vacuum.